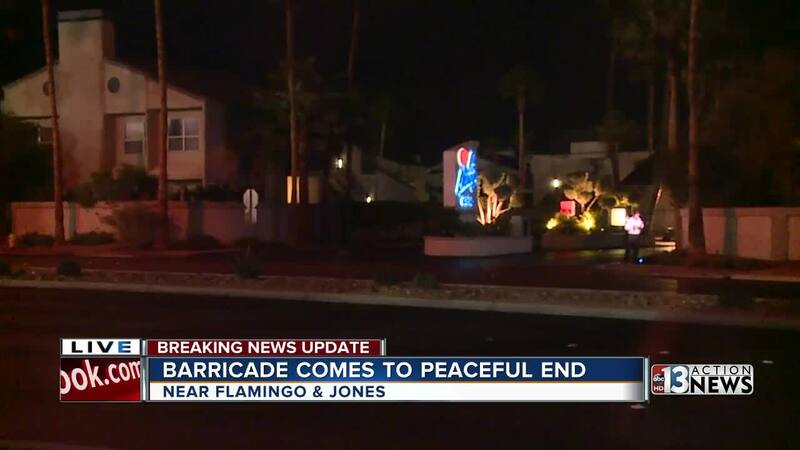 A barricade situation that dragged on for hours near Jones and Flamingo ended peacefully Wednesday night. Police said a suspect was in custody after pulling a gun on a driver and then holing up inside an apartment complex. From the air Chopper 13 showed the tremendous police presence at the La Mirage apartment complex that began around 4 p.m. Wednesday afternoon. Las Vegas police say it all started with an incident nearby at El Camino and Flamingo. Police say a crash led one driver to pull a gun on another driver. Linda Addington was at home with visiting relatives. "I heard the helicopter just circling and circling," she said. "We were in the middle of the section where the pool is and the walkway," said Addington. "Then in front of my place there were cop cars everywhere and K9 units. At that point police were knocking on the doors saying it would be advised to evacuate so we left." As night fell officers continued to negotiate with the suspect barricaded inside. Roads around the complex were blocked to traffic during rush hour and residents were growing impatient in a nearby parking lot waiting for it to all come to an end. "I'm tired getting home from work," said Sergio Morales. "And it's pretty exhausting.And I just want to go home." "We thought after 4 or 5 hours it would be safe to come home and it wasn't," said Addington. Then just before 8 p.m. police confirmed the suspect was taken into custody without incident.